Electricity is transmitted mainly through overhead lines or underground cables. Due to the resistance of the transmission wires, there is always some loss of power through the heating effect of current. The electricity transmission systems must be designed in ways which reduce this loss as much as possible. Electricity generated in power stations is raised to a very high voltage for transmission. This is to reduce the current flow to the transmission cables. The power loss is proportional to the square of the current, thus a small current greatly reduces heat loss. As seen from the equation above, a small current can be achieved by using a high voltage. For example, if we double (×2) the transmission voltage, the current would be halved (×1/2), and the power loss would be reduced to a quarter, (1/2)2 = 1/4, i.e. 25% of the original value. We see from the equation above that the power loss in the transmission wire Ploss is directly proportional to the resistance R of the wire. The lower the resistance, the lower will be the power loss. 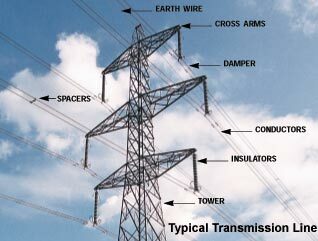 Copper and aluminium are the most commonly used metals in transmission wires. They are very good conductors, cheap, resistant to corrosion, and strong. The resistance of the transmission wire is lowered by making the wire thicker. Thicker wires have larger cross-sectional areas and therefore lower resistance. Overhead lines are held high above the ground by metal towers called pylons. If you look at a pylon carefully, you will see that the overhead lines are held by a stack of discs hanging from the pylon. 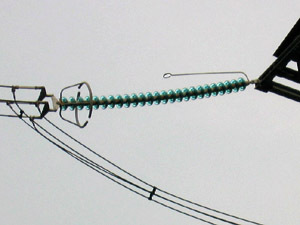 This stack of discs is a series of suspended insulators which prevents the line from being electrically connected to the pylon. This prevents the electrical leakage from transmission wire to the ground. what do you mean by high voltage can produce low current?